Exercise technique is the take away theme in Turbulence Training Day 12. Home fitness workouts that'll burn fat and sculpt your body in 4 weeks. 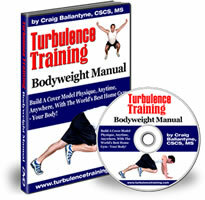 Welcome to day 12 of Turbulence Training's Buff Dudes and Hot Chicks fat burning workout. "Hello there and welcome, I'm Asad from Better4Fitness.com, and this is day 12 of the Buff Dudes and Hot Chicks workout. Today's definitely the toughest day of the lot. With the bodyweight intervals at the end, it really gets you using all of your energy resources. By the end of it you're totally spent, which is actually a really good feeling. As long as you're not too hard on yourself then you can take something away from it and improve for next time. That's exactly what I did today, it was an improvement from last week. I'm not setting any world records, but neither do I want to (it's not my goal). So I'm staying focused to what my aim is and I'm improving each week and that's the best way to go about it. The most important take away point from today, is that I know a lot of people when fatigued and all they want to do is complete the workout (complete all the sets) and they'll feel like they've achieved something. But you shouldn't compromise quality (exercise technique) for quantity. By that, I mean that you should stick to whatever you can do with good form. If you lose your form, don't try and force it just to complete the sets, 'cos if you don't know what you're doing that'll lead to injury. So, when you're fatigued, if your exercise technique's gone, then STOP. Sometimes it's hard to tell when your form has gone, because your body's telling you one thing but when you look back on it, your body was actually doing something completely different. That's something I've seen by recording myself. So if you've got a camcorder or anything that can record your workouts then it's a really good way of seeing when your exercise technique actually goes within your workout. So you know exactly when to stop for next time, or which exercises you need to improve exercise technique before you can push on in terms of weight or reps. That's the main take away point from today. Enjoy today's speed mash up, I've mixed it up a little bit to keep things interesting. Have a good weekend and I'll see you on Monday, take care."